Baltic Ground Services (BGS) an international provider of ground handling, aircraft fueling and railway freight transport has announced its business expansion. BGS subsidiary company in Ukraine – BGS Rail, engaged in railway cargo services, in cooperation with counterparts from its global sister company AviaAM Leasing, has signed a strategic cooperation agreement with governmental company from China – Henan Civil Aviation Development & Investment Co. Ltd. (HNCA). With this strategic agreement, companies will establish a Joint Venture and invest together in acquisition of 10 000 brand-new railcars built in Ukraine. After the evaluation of the excessive need, companies have also considered the possibility of partial order implementation in Chinese wagon producing plants. Counterparts forecast, that the project’s scope will be reached within upcoming 2 to 5 years while potential value of the deal might reach up to 500 million USD. “This business step is a continuation of the BGS Rail’s successful business activity reached within the last 6 months under the Avia Solution Group acquisition and development initiative. We highly value the Joint Venture agreement with Chinese counterparts and are sure that it will lay a solid foundation for sustainable business growth,” says Mindaugas Vaicikauskas, Deputy CEO of BGS Rail. During this year, BGS Rail has already expanded its fleet to 424 railcars and schedules to raise the number by adding additional 170 new railcars by the end of the year. 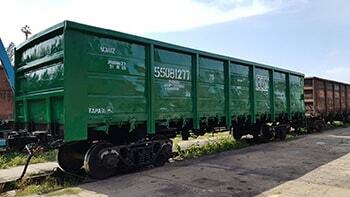 With this acquirement BGS Rail will become one of the top 15 freight car operators in the Ukrainian market with a fleet of 594 railcars in total. Subsequent business growth in cooperation with new Chinese partners will allow BGS Rail to reach one of the top rail cargo operators status in Ukraine and operate over 10 000 railcars. “BGS Rail” a railcar logistics company which activity is based on short-term and long-term lease of general-purpose open and open-top wagons with hatches for the transportation of coal, rubble, rolled metal products, wood, and other cargo. BGS Rail is a part of “Baltic Ground Services” – an international provider of ground handling, aircraft fueling, liquid ADR logistics, railcar logistics and unique IT solutions for airports. The company operates in Lithuania, Latvia, Estonia, Poland, Czech Republic, Russia, Ukraine, and Germany. “Baltic Ground Services” is part of Avia Solutions Group – an international aviation holding company with over 30 subsidiaries worldwide. 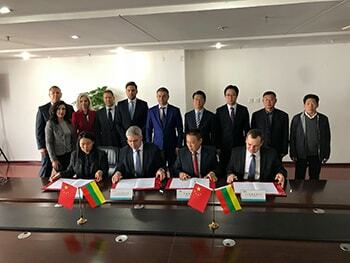 “AviaAM Leasing” – global aircraft leasing company is the biggest investor in China from Lithuania. Back in 2016, AviaAM Leasing together with Henan Civil Aviation Development & Investment Co. Ltd. (HNCA) the company has established a Joint Venture – AviaAM Finantial leasing China, which now operates 15 brand new Airbus and Boeing aircraft. The total value of the fleet is 835 million USD. AviaAM Leasing company co-operates with the biggest banks in Asia, including but not limited to China Development Bank, The Export-Import Bank of China, Bank of Communication, Bank of China, China Merchants Bank, and China Construction Bank. AirFinance Journal ranked AviaAM Leasing amongst world’s TOP50 aircraft leasing companies for three years in a row.